Now it's time to take a closer look at the twisted world of DNA. Inside our cells, our DNA is wrapped around ball-like packing proteins called histones, forming something known as chromatin. But what does chromatin look like? And why doesn't our DNA get all tangled up? Dr Nick Gilbert, also at the MRC Human Genetics Unit in Edinburgh, is trying to find out. Nick - If you isolate chromatin from cells and unfold it and look at it under a microscope - a very high-powered microscope like an electron microscope - what you would find is that it looks like sort of beads on a string-like structure. But if you then fold up this chromatin into what you'd normally expect in a cell, it has a sort of much more folded appearance and'sthickened out and we actually call it, something called a 30 nanometre fibre. So, not a very imaginative name, but that's the sort of the dimension you see under the microscope. Kat - It strikes me as an incredible feat of packing. You've got these long, long strings, you wrap them around beads, you coil them up, and coil them up, and coil them up, and shove them all into the nucleus. How does it not get twisted up? How does it not end up as just a massive mess? Nick - Now, that's a very interesting question and it's something that's very important for the cell to avoid and the cell has some fairly complicated enzymes which were actually responsible for removing a twist that's actually introduced into the DNA. And a lot of these enzymes are topoisomerases ,so these are enzymes that can chop the DNA like a molecular pair of scissors, remove some of the twist and then stick it back together again. There's also another class of enzymes called helicases and these helicases are like little molecular motors that can twist the DNA. And interestingly, there are a couple of human genetic diseases where there are mutations in some of these helicase proteins, and these are very, very rare genetic diseases. For example, Bloom syndrome and Werner syndrome, and in these patients, the little helicases don't work properly and then there are problems with packaging the genome. Kat - So, how do these helicases and these topoisomerases work out where they need to go and what they need to be doing? Do we know how they sense whether DNA is too twisted or not twisted enough? Nick - So, that's something we really don't have much of an idea about. So, we did a study recently where we did some experiments on topoisomerases and one of the things we concluded from these experiments is that these enzymes must have the ability to sense twist. But we've got no idea as to what that mechanism is, whether they're actually recognising a change in structure in the DNA or if there are other sensing proteins that can signal to the topoisomerases that they need to be active in different parts of the genome. What we did find though is that there are - in mammalian cells, there are two main classes of topoisomerases and from our experiments, they appear to have different distributions in the genome, implying that they might have different functions in different regions. But that's really a very broad scale and we need to do more experiments to actually understand how these enzymes detect changes in twist. Kat - It's an amazing image to think about that you've got these little beads of protein being shuffled about on our DNA. You've got little machines pushing them around. You've got things untwisting DNA, twisting it back up. It's very dynamic idea of what's going on in the nucleus of a cell. Nick - Well, I think historically, people have thought of chromatin as a very static structure, but this is probably a reflection of the techniques people have used. Historically, people have used microscopy to look a lot of these processes, but microscopy is used on samples that have been fixed, so they're sort of static samples. Kat - They're dead stuff basically. Nick - Essentially, but what we have found now is that using a lot of new techniques that actually a lot of the proteins in the cell as you say are very, very dynamic. And we need to think of the organisation of DNA and its packaging in the cell as a very dynamic process that's constantly responding to for example, gene transcription or DNA replication or just other external stimuli from outside that the cell needs to respond to so it can express certain genes. So, it's very important for us to develop new techniques to actually look at these dynamic processes as they're actually occurring in living cells. Kat - So, tell me a bit about the work that you're doing, how are you trying to unravel this complicated problem? Nick - So, my lab is really interested in looking at the structure of DNA and how DNA is then folded into the sort of fundamental chromatin fibres. So, we've spent quite a lot of time looking at the structure of these chromatin fibres in cells using a combination of sort of biophysical techniques and very high resolution imaging. And what we find is that in different parts of the genome, these chromatin fibres have slightly different structures. What we've been doing recently which is very interesting is to actually look at the structure of DNA in cells and there's really so much still we don't know about it. For example, we know the structure of DNA in a test tube on the lab bench, but we don't really have an idea of the structure of DNA actually inside the cells. So, what my lab has been doing over the last few years is try and develop new techniques for analysing the structure of the DNA whilst it's still in the cell. And we've recently developed a new sort of molecular probe that can distinguish between DNA that has a very twisted structure and DNA that has a less twisted structure. And we are able to show that the genome is actually organised into large domains of twist and I think this is something really very interesting that we're going to carry on studying. Kat - You mentioned earlier that there are some human diseases where there are problems with the helicases that twist up DNA and the topoisomerases that untangle them. 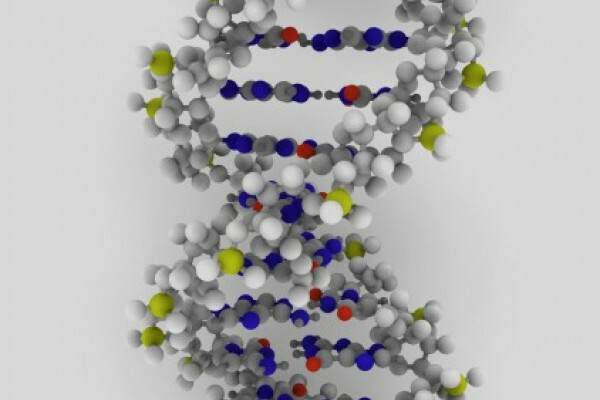 Do you think that DNA twisting could be important in some other human diseases? Nick - Yes, I think absolutely. For example, in diseases like cancer, you find that topoisomerase enzymes are often upregulated and what we imagine is that this might have an effect on the DNA structure so that maybe the chromatin is not packaged properly and it enables other genes to be misregulated. And cancer really is a disease of gene misregulation. And if you start messing around with the proteins that are responsible for packaging the genome properly then chances are, then genes will be expressed at the wrong time and in the wrong cell type. And that really could be a very important initial cause of cancer and might also well be important in the evolution of diseases like cancer. Kat - That was Dr. Nick Gilbert from the MRC Human Genetics Unit in Edinburgh.